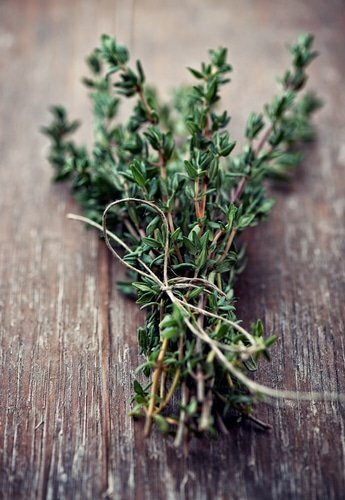 try natural herbs, like thyme, to fight acne. There’s no shortage of skin care treatments for oily skin and clogged pores out there, but most of them are full of sulfates, preservatives, alcohols, and other harsh ingredients. Not only do these formulas lack nourishment for the skin, but they can also be irritating, causing burning, redness, and itching, and can actually encourage skin to age faster than it normally would—particularly if you use them in your 30s, 40s, and beyond. Unfortunately, for many of us, oily skin and clogged pores doesn’t go away after we leave the teenage years behind. We don’t have to subject the skin to harsh, chemical treatments, however, to get rid of it. Nature provides us with a number of more gentle, nourishing options. It may take a little trial and error to find which herbal approach works best for you, but once you notice the effects on your skin, you’ll realize its well worth the effort. Thyme: Thyme is a successful herb for oily skin and clogged pores. If you're looking for a product containing it, try our Radiant Skin Silk Body Lotion, which contains thyme. Garlic: The best approach is to rub a raw clove directly on the affected area. Neem: Native to India, neem is an herb that comes from the fruit of the neem tree. This herb helps control oily skin. No coincidence that we have it in our Herbal Facial Oil for Oily Skin! Lemon: Lemon has the inherent ability to clean. Because of this, it’s long been used as a home remedy foroily skin and clogged pores. Try your own tincture made of lemon juice and water as a morning cleanser, or better yet, try our Aloe Herb Cleanser, which contains lemon. In addition to helping to cleanse the skin, lemon also contains a good amount of vitamin C.
Black currant oil: This herb comes from a woody perennial shrub native to northern Europe. The oil is made from the seeds, and has a reputation to help with oily skin and clogged pores. It contains a number of antioxidants, as well as vitamins C and E. Flavonoids like myricetin, kaempferol and quercetin all provide protection from environmental stressors. Tea tree oil: This potent oil is effective for oily skin and clogged pores. Many people can be sensitive to tea tree oil at full strength, however, so it may be best to dilute it with thyme or neem or one of the other oils mentioned here. Calendula: Because of its natural properties, calendula is often recommended to help with oily skin and clogged pores. To use it, you can simply wash the skin with tea made from the flowers. Blue tansy: This oil has a reputation for being a powerful herb for oily skin and clogged pores. It can stain your skin, so it’s best mixed with a carrier oil or with one of the other oils listed here. Do you use other natural herbs for oily skin and clogged pores? Please share any tips with our readers.